For the first time in years, we’re preparing to have a holiday tree. Not a Christmas tree per se, since we’re freaky pagan beatnik people — although since the Christmas tree is totally pagan in origin, it’s all a big religious mishmash anyway. We haven’t had a tree for years — back in Seattle, an actual cut tree was the thing to do. While they always smelled fabulous, the mess of needles left behind was just too much. 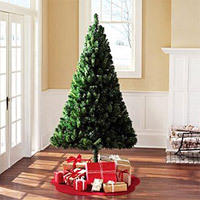 Fortunately, we now live in Florida, where apparently everyone who’s anyone has an artificial tree. It won't look this good. We hit a few locations, but ended up with this super-cheap tree from Wal*Mart. We didn’t want to spend too much on the tree right off the bat, because we have no idea how the cats are going to respond. They may ignore it. They may play gently with it. Or they may shred the everloving hell out of it. Best to start cheap. We also got a bunch of “unbreakable” (read: plastic) ornaments, so at least I don’t have to worry about any shattered glass around the cats. Our color scheme will be silver and blue. No, we’re not Jewish (despite the last name of Meyer) — we just liked the colors together. I made a half-assed effort to get Scott to agree to a white fake tree with black ornaments, but then we decided that we might regret that collection of decorations in future years. Although it’d go beautifully with our zebra-print couch cover. The toughest decoration to find so far has been a tree topper. It seems that every single store has only two options: star or angel. Whatever happened to finials? I remember my folks had a really cool multi-colored finial for the top of our tree when I was a kid. I can find them on Amazon (see right) in any color of the rainbow (and one rainbow-colored one), but I’ve yet to see one at a brick & mortar store. Target, Wal*Mart, Lowe’s, even the ginormous Old Time Pottery home decor store — all just stars and angels. I’m also planning on some experimental baking this holiday season. We don’t do the carbs, so the list of cookies, cakes and pies is short (but not as short as you might think). I’m planning on pumpkin-spice cheesecake with a nut crust, as well as flourless peanut butter cookies (perhaps with coconut included). I’m also poking around the internets trying to find a way to get the flavors and texture of gingerbread cookies without the flour and/or molasses. But that’s a toughie. PLEASE post any great recipes you come up with! My all-time favorite cookie is peanut butter, and I will always vote yes for coconut-anything. Can’t help you with the finial, but I can wish you good luck! Fret not — I love to post my recipes. And pictures of food.